I’ve been posting “Bay Watch 2019” photos on Facebook for the past month or so, and today is the first day where I could see open water from our little bluff overlooking East Bay. On the way home from town, we stopped before we got to The Bluffs, and I took a few pictures of the ice starting to break up – today’s Photo of the Day. There’s a lot of open water, but still some ice out there moving around, too. I’m guessing it’ll disappear over the next day or so. 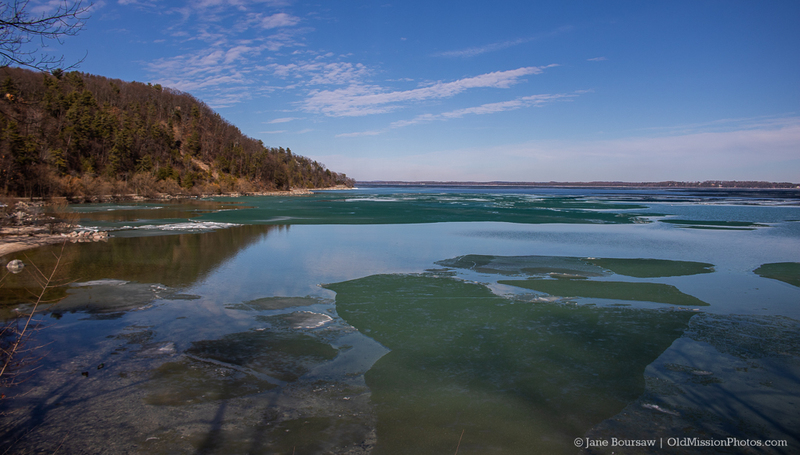 Along with the excitement that spring might actually be arriving on the Old Mission Peninsula, the colors of the bay are astounding – green, blue, gray and everything in between. I’m also glad to be thinking about dragging the kayak out from behind the rock and into the water. This photo is available for sale as a download, print, wall art and more at our sister site, OldMissionPhotos.com.